Lake Erie in Great Lakes, GL - 3D Map 16 x 20 IN - Laser carved wood nautical chart and topographic depth map. Lake Almanor in Plumas, CA - 3D Map 16 x 20 IN - Laser carved wood nautical chart and topographic depth map. Chesapeake Bay (Annapolis Region) in Anne Arundel, MD - 3D Map 16 x 20 IN - Laser carved wood nautical chart and topographic depth map. Ossipee Lake in Carroll, NH - 3D Map 16 x 20 IN - Laser carved wood nautical chart and topographic depth map. Lake Cavanaugh in Skagit, WA - 3D Map 16 x 20 IN - Laser carved wood nautical chart and topographic depth map. Lake Champlain in Franklin Grand Isle Addison Chittenden Clinton NY, VT - 3D Map (Black Frame/No Glass Front) 14 x 18 IN - Laser carved wood nautical chart and topographic depth map. Lake Wallenpaupack in Wayne Pike, PA - 3D Map 16 x 20 IN - Laser carved wood nautical chart and topographic depth map. Congamond Lakes in Hampden Hartford, MA - 3D Map 16 x 20 IN - Laser carved wood nautical chart and topographic depth map. 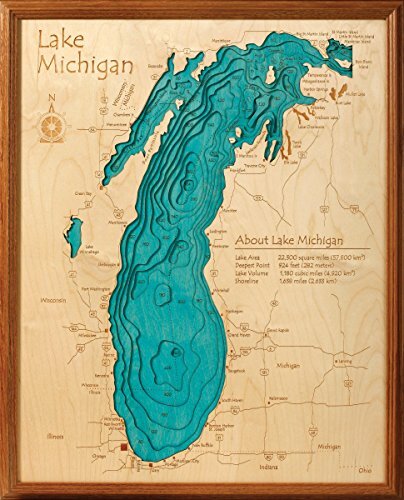 Wolf Lake in Lake, MI - 3D Map 16 x 20 IN - Laser carved wood nautical chart and topographic depth map. Lake Lure in Rutherford, NC - 3D Map 16 x 20 IN - Laser carved wood nautical chart and topographic depth map.